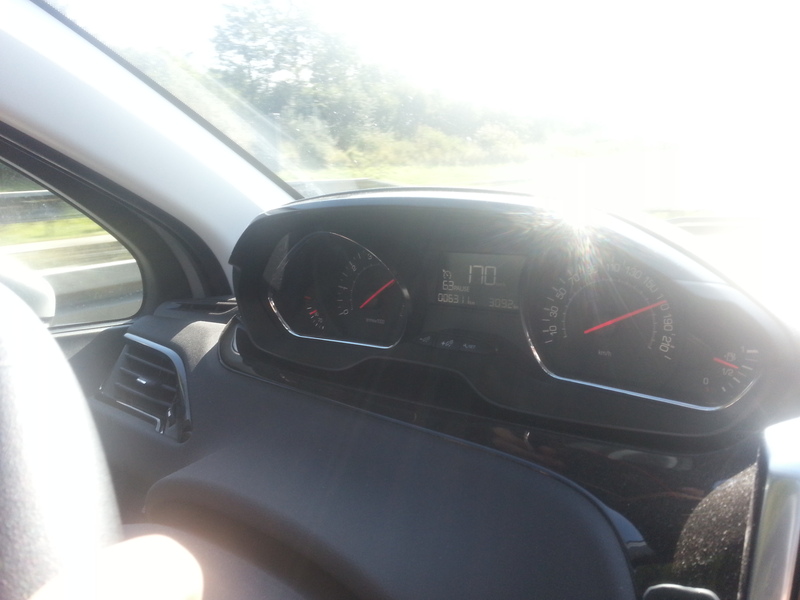 Into Germany we went, for good this time, and one of the first things we found: an Autobahn! I’d been looking forward to getting on one of these for ages, and I’m not going to lie – we did go pretty fast (sorry mum). We spent most of the time cruising at around 140km/h, and peaked at a little over 170. Unfortunately I don’t think our little car was really intended for speeds that high, so that was realistically about as fast as we were going to get. The crazy thing was that even then, we were still in the slow lane and were getting passed by almost every other car on the road, none of which could have been travelling under 200. I loved it, but next time I go back I’m getting a faster car. Aside from the Autobahn, the route we took was very nice, particularly while we were closer to Austria. 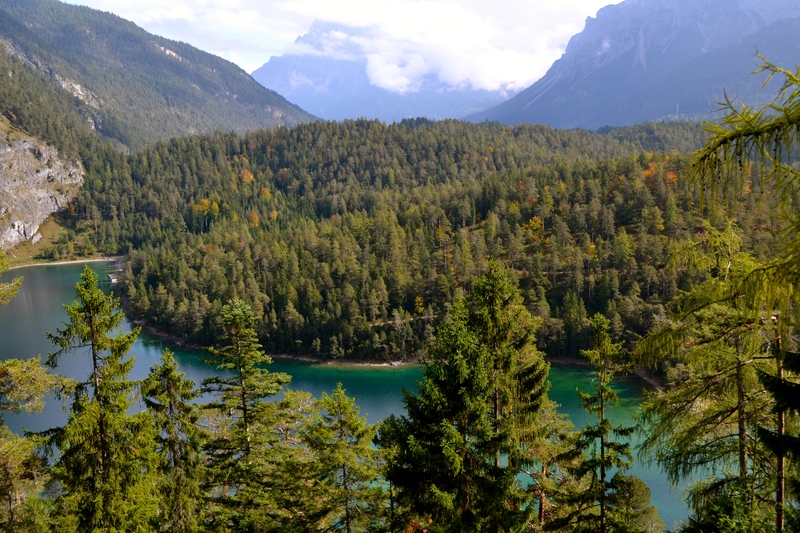 The weather had cleared a lot since we completely failed to see Neuschwanstein the day before as well, which meant that every time we climbed one of the many hills along the way we actually got to see the beautiful views. We made it to our Gasthof quite quickly, helped by shedding a lot of unnecessary petrol weight along the way. 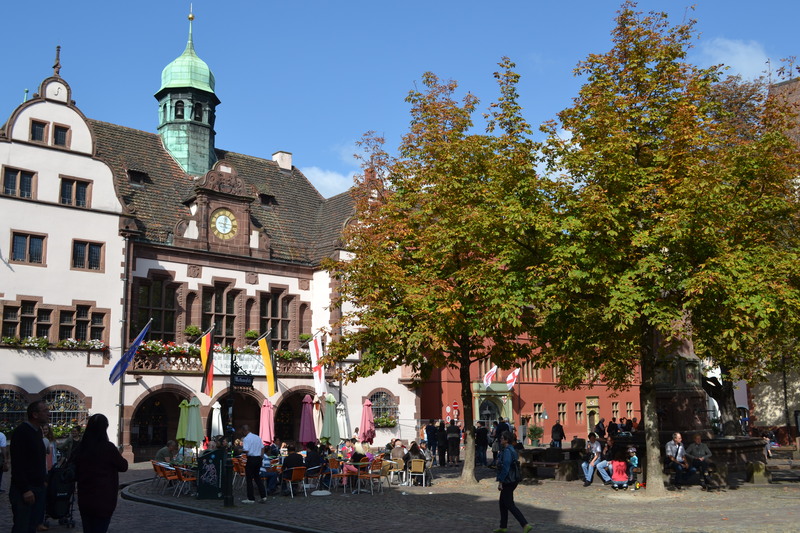 We had decided to stay out in the countryside, in a valley near a small town called Simonswald in the Black Forest, and commute the 30km or so into Freiburg the next day. The countryside: very grand, and quite beautiful. The Gasthof: quite nice. 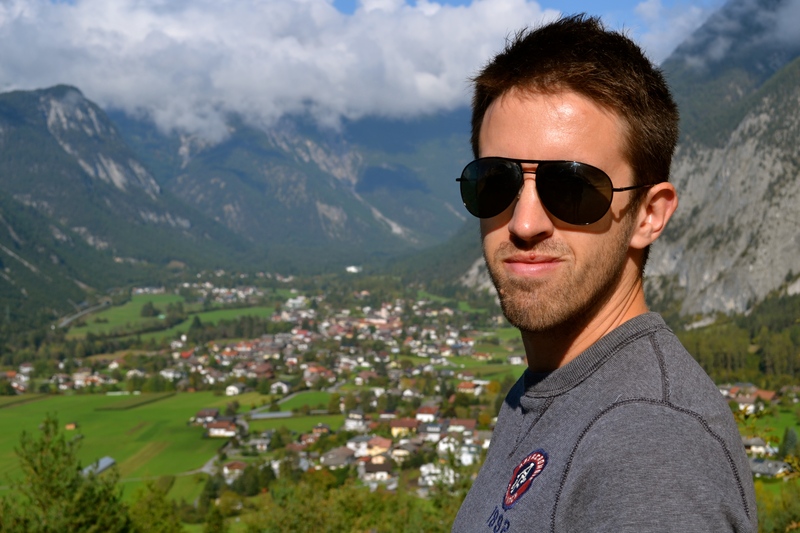 The guy who ran the Gasthof: very odd. He just wasn’t the sort of person cut out to be left in charge of interacting with people, which is probably why we only talked to him once and stuck with his wife the rest of the time. The following morning we left early for a day out in Freiburg. Freiburg prides itself on being a ‘green’ town, and one of the things they have done to back this label up is ban almost all traffic from the middle of town (kind of annoying when we wanted to get there, but actually really nice once we arrived). We parked at one of the park’n’ride places and caught a tram in, which was not too much of a hassle. 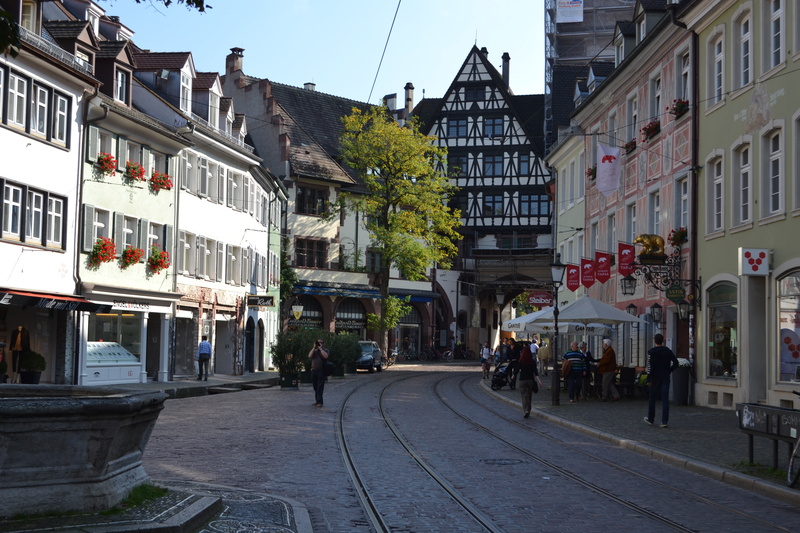 Our first impression of Freiburg was that the city might have recently been abandoned. There was just literally no-one around, aside from us and some other bemused looking tourists. The entire centre of town was just shut. It turned out to be reunification day, probably the biggest holiday in the German calendar, and that all the shops were closed (they made up for this by being open for 24 hours the next day). 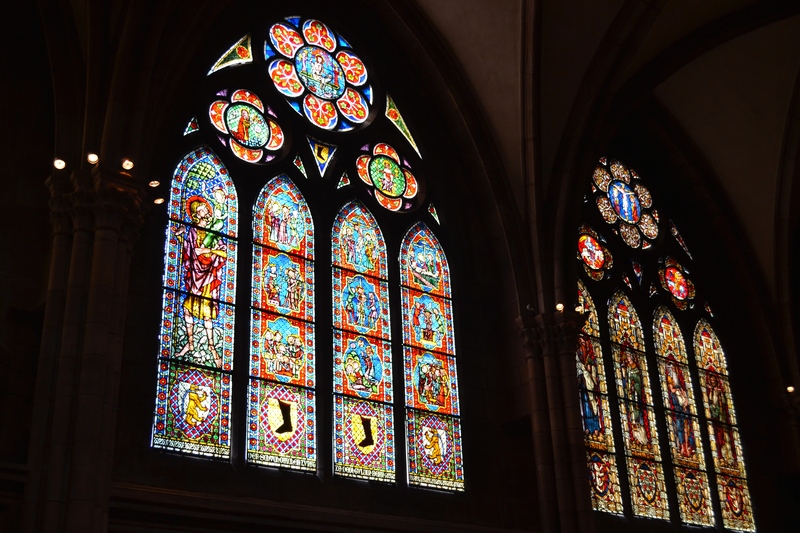 We wandered right into the centre, and decided to check out the cathedral for lack of anything else to do. 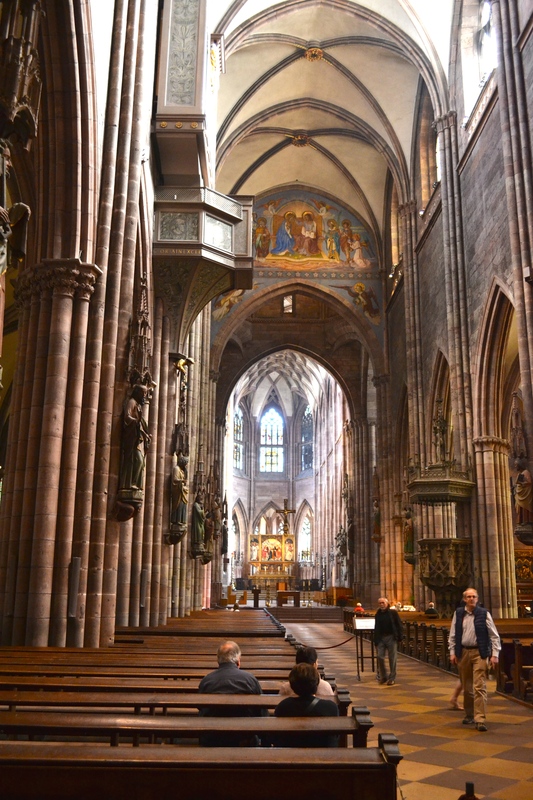 We had seen a fair few by this stage of the trip, so we didn’t linger long, but Freiburg cathedral was very nice inside. Quite a different style to most of the others we had seen so far on our trip, which made it a little more interesting. It was about lunchtime after we’d finished looking around, so we went in search for somewhere to eat. Luckily cafes seemed to be about the only places that were actually open that day, and after hunting around for a while we found a prime spot in the sun by the river. We both got a local beer and a big plate of schnitzel, and spent a very enjoyable few hours just relaxing and soaking up the beautiful weather. We were both a little conscious that we were nearing the end of our road trip, and given that we would be spending the upcoming winter in London we figured hot days like this might be hard to come by. We definitely made the most of this one. After lunch we went for a walk around the rest of the town, which had started to liven up. 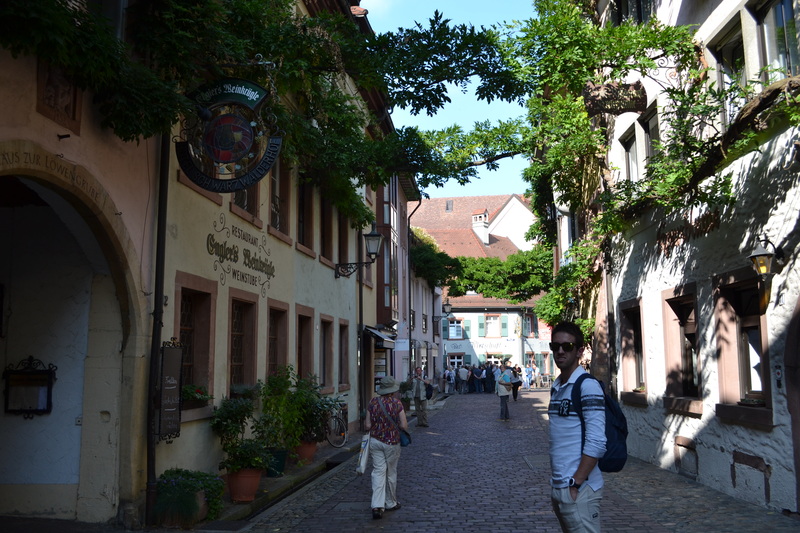 I found Freiburg to be a really nice place to just wander in. The whole old town is all cobbled streets and quaint old buildings, which I thought had been adapted to modern living very well (we’d found in a few places that a lot of the history of the old part of town been at least a little diminished by the adaptation of the old buildings into modern shop frontages). 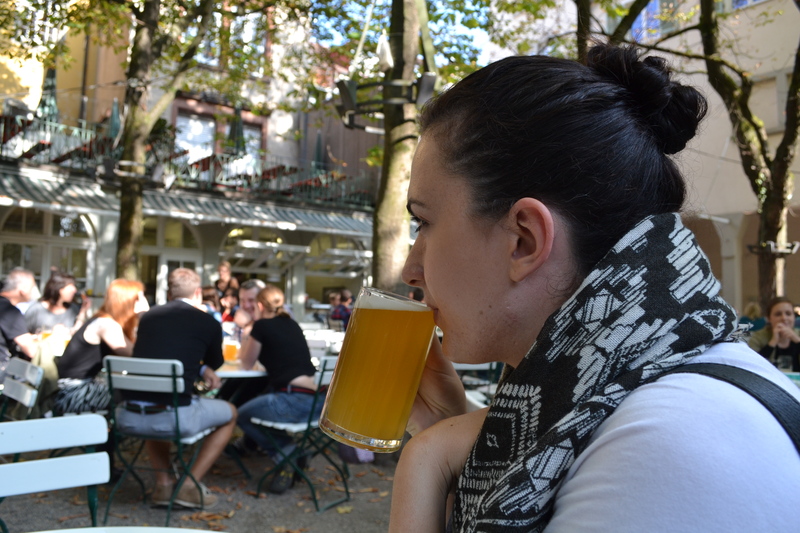 While we were exploring we came across our first proper German beer garden! It was getting later in the afternoon by now, and the beer garden looked like it was beginning to fill up so we went in and found ourselves a table. It turns out that traditional Lederhosen isn’t just for Octoberfest, it is actually worn all the time by the locals when they head out for a beer. Probably about half the people in the place were wearing the traditional clothes, and the atmosphere was pretty cool. Bridget had another beer, I had a juice (I had to drive home shortly) and we each had a delicious pretzel, the best either of us had ever had. We had dinner in town before heading home, mostly to avoid spending time with the weird guy back there, and chose a burger bar in near the university. The food was delicious again, but the meal was memorable for quite a different reason. A little bit before we left, a girl sitting with her boyfriend got up halfway through her meal and went inside for some reason. While she was gone, a very crazy-looking old guy wandered up, sat down in her place and started eating her food and drinking her beer. The poor boyfriend opposite looked a bit lost for words. After a few bites, the crazy guy got up, stole the plate of food and the glass of beer and just wandered off down the street shouting things at people. Bridget was so worried that he might come back that she covered all her food with napkins so that if he did, she wouldn’t be seen to be a target. (Photo below is pre-this event). 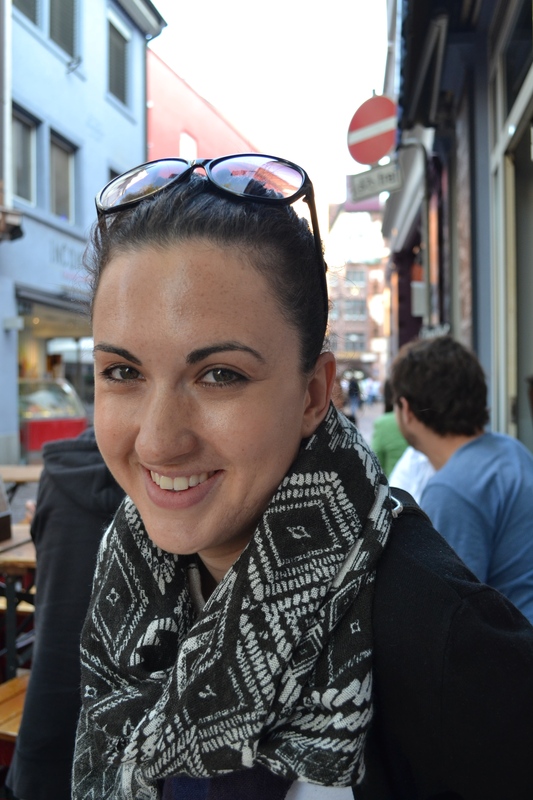 It was another lighting visit, but Freiburg was fun. 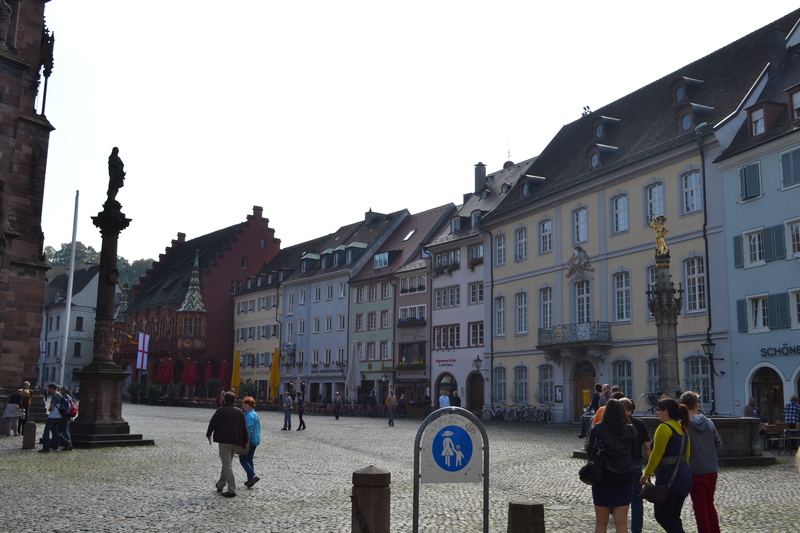 It was our one and only overnight stop over in Germany, since the next morning we’d be heading back into France (B was a little sad, since she was enjoying being able to use her excellent German skills). Next stop on the trip: Dijon.